The penultimate Hyouka staff translation is an early interview with its creative duo originally published in the July 2012 issue of Newtype, which deals with their impressions and insight early into the production. We chose this one in particular since the grand finale will be another, much longer talk with them that happened once the series wrapped up – this way you’ll get to see how even the creators themselves evolved through the project. For now, enjoy this one! ─ Now that you’ve been working in Hyouka, what sort of feedback can you share? Takemoto: It’s a complicated show. Ever since the beginning, I’ve thought that it would be a bit of a controversial work, which is why we are in the middle of making approachable and as enjoyable as possible. Gatou: Before we had the visuals, I hadn‘t expect the characters to turn out to be this adorable. During the script reading at the scenario meetings, director Takemoto kept stressing out that we should make them charming. Takemoto: That’s because I wanted the characters to be loved by many people. So making them adorable was actually an important factor this time. ─ What were your plans on how to portray the protagonist Houtarou Oreki? Takemoto: Houtarou isn’t simply trying to act cool, he has his reasons for behaving that way to begin with. Keep in mind that he’s still a freshman in high school. Gatou: We wanted to preserve his immaturity, inexperience, and vulnerability. Takemoto: When I read the novel early on, I thought that Houtarou’s weaknesses and vulnerability were very appealing. Gatou: It’s episode 8 where he truly becomes the protagonist. We were present at the recording session and his voice actor Yuuichi Nakamura-san was so amazing that he made me think he might be a monster (laughs). Takemoto: There’s plenty of dialogue and exposition, but he performed it all smoothly and with tremendous skill. Gatou: Although I tried my best to cut down on the number of lines as much as possible, it still was a large amount so when I greeted him, the first thing I did was apologizing (laughs). Nevertheless, he acted it out so brilliantly that he managed to surprise me. Takemoto: Nakamura-san told me that Houtarou is talkative during explanations but when it comes to himself, he says very little. And so he wanted to put effort into those few words. He performed such a tricky role with great ability. ─ What about the heroine, Eru Chitanda? Takemoto: She is a lively and refined lady. When I was first drawing the storyboards, I couldn‘t fully envision Eru. I had my doubts that such an elegant and lovely girl could actually exist, but once I had heard Satomi Satou-san’s voice, I realized that it was indeed possible. It’s a role that asks you to put your whole being into it. Takemoto: Ahh, about that, I told the animation staff to give it their best. Gatou: The part in episode 7 where Eru wakes up really hit me right in the heart. ─ Eru’s first I’m curious about it! scene and the color of her eyes are a highlight. Gatou: Director Takemoto made it clear from the beginning that a powerful gaze was important. 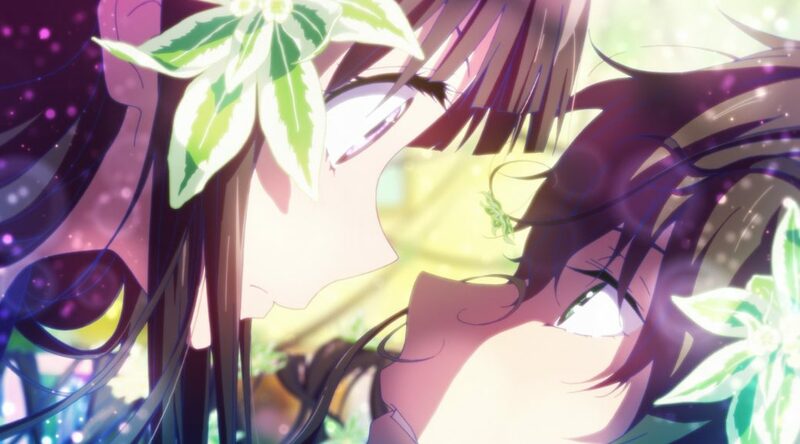 Takemoto: I regard the Boy Meets Girl concept as the first foundation of Hyouka. I wanted to depict it by focusing all of my senses on the meeting part, which resulted in that scene. It’s the same with Eru’s eyes; I’m fond of eyes as an element in my projects, so I always end up concentrating my energy on them. 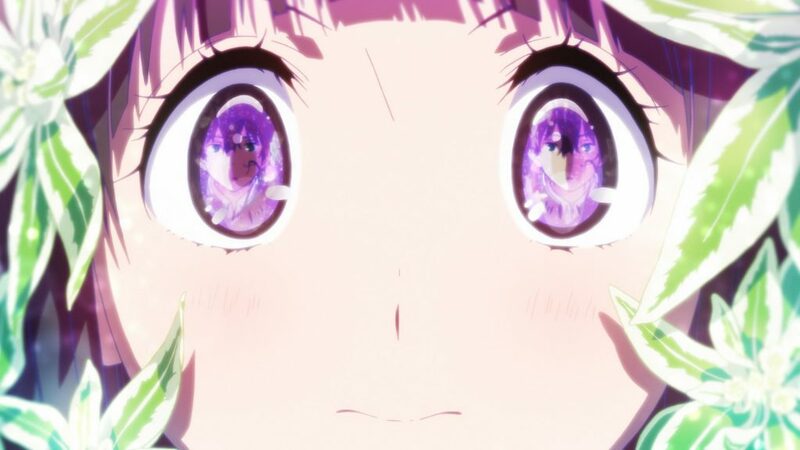 It was already written in the source material that Eru has large eyes, and in order to portray them a gaze powerful enough to persuade Houtarou, I went through trial and error with character designer (Futoshi) Nishiya and color designer (Naomi) Ishida until that scene turned into its current form. ─ The inventive portrayals of the daydreaming scenes are impressive as well. They are easy to parse and diverse. Takemoto: The most interesting aspect of this work are the subtleties and ripples of the human mind. In order to express those visually, I decided to include expressionist sequences that are not restrained by traditional hand drawn animation. I asked each episode director to let their creativity run wild and made them come up with their own ideas. 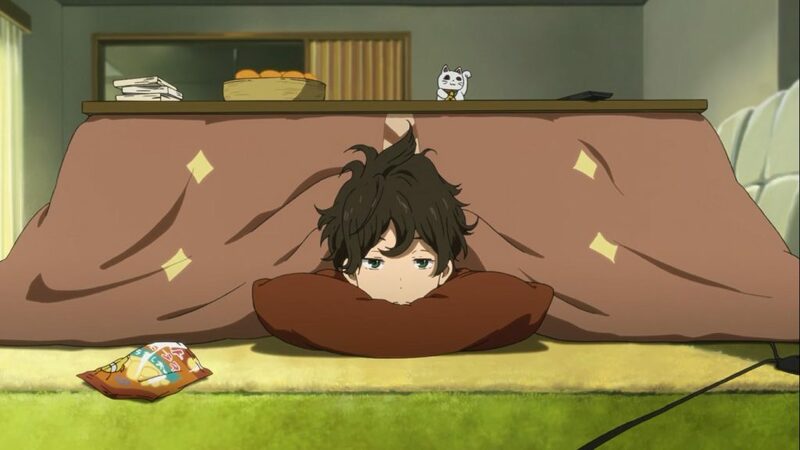 Gatou: Since Hyouka is always, without exception, portrayed from a Classics Club member’s view, nothing is told from a neutral or omniscient perspective. For this reason, those fantasies are also fully filtered by someone’s perspective. Although this also meant we couldn’t sneak into places they haven’t observed. Takemoto: The lack of a neutral point of view is essential in Hyouka. We have to stay in compliance with it. ─ Well then, starting with episode 8, there will be a new major development. The eyecatches contain the 24 divisions of the solar year, but were the changing seasons a factor in the series composition too? Gatou: For the Hyouka anime, we composed the Classics Club series mostly in chronological order. Takemoto: As we worked on the series composition, we realized that we got really into the 24 divisions of the solar year. It served as another method of visualizing the printed text. The theme of episode 8 and onward will be a movie, which is especially compatible with the anime medium. Gatou: Many splendid voice actors participated in that featured film. Their roles were not easy but they performed them excellently. Takemoto: The long-awaited culture festival will be one of the highlights in the second half. Gatou: Ahh, how should I put it, I’m sorry! Animating all of that must be a lot of work… but I can’t wait! Takemoto: There’s plenty to see in the culture festival so please do look forward to it. Originally published in the July 2012 issue of Newtype. Translated by Pen, who will be spearheading this special Hyouka project.